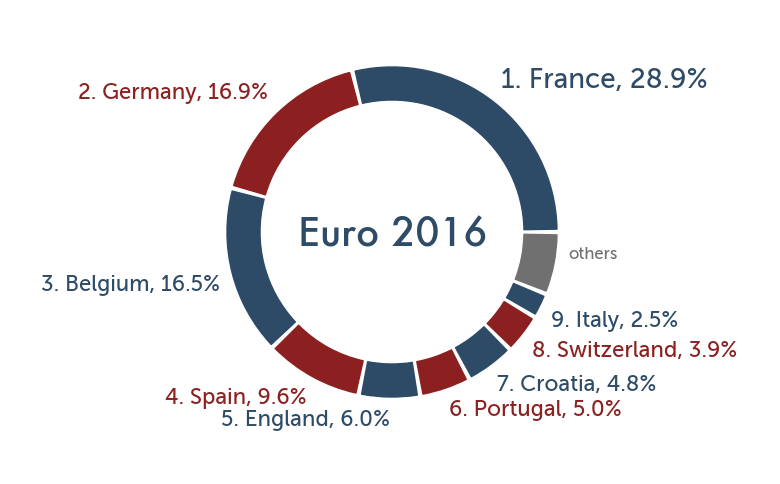 At the beginning of Euro 2012, The Power Rank assigned Croatia as the 46th best team in the world. This was the worst ranking among the 16 teams. Then a reader pointed out in the comments that Croatia is 8th in the FIFA rankings. We looked into this further and found two World Cup qualifying games against England in which Croatia lost 9-2 on aggregate. Since our algorithm considers margin of victory, these games greatly depressed Croatia’s rank. When we do not consider these two games in the rankings, Croatia jumps from their current 33rd ranking to 22nd. We have no explanation why FIFA ranks Croatia 8th. So Croatia is the VCU of international soccer. In last year’s NCAA men’s basketball tournament, VCU made an epic run from last team in to the Final Four. Point guard Joey Rodriguez even admitted that they didn’t take some of their conference opponents seriously, a move that almost left them out of the tournament. They decided to play once the big dance started, winning 5 games on their way to the Final Four. Against Italy today, Croatia managed a 1-1 tie after a beautiful finish from Mario Mandzukic in the second half. Croatia has a 3% chance to win Euro 2012 and make our methods seem a little silly. For all of our most updated win probabilities, click here to see our interactive bracket. How did Spain’s odds of winning Euro 2012 change after their first group match? Spain didn’t look quite right. Too many long balls over the top. Too many shots from outside the box. Not enough crisp passing between players forming triangles all over the field. Did Italy’s defense take Spain out of their game? Probably not, as our algorithm ranks Italy’s defense 25th in the world. This isn’t the type of ranking one expects for a country famous for their catenaccio system. Maybe it’s just Spain’s first game this tourney. Or maybe this core group of players is past its prime. We’ll find out in their next match against Ireland. Spain’s odds to win Euro 2012 dropped from 22.6% to 21.5%. This is because Croatia beat Ireland today, putting them in control of this group with Italy and Spain. Croatia’s increased chance of making out of the group stage dropped Spain’s odds of advancing from 83% to 80%. For our most updated win probabilities, click here to see our interactive bracket.